The World Conference on Tobacco or Health (WCTOH) is the largest gathering of researchers, health professionals, policy makers, social workers, and indeed all anti-tobacco advocates all over the world. The 17th edition held in Cape Town from 7th to 9th March, with preconference workshops on 5th and 6th. It is the first time the conference is hosted in Africa, and there is palpable focus on Africa. This is because African countries generally have low tobacco smoking prevalence, but are a target and ready market for the tobacco industries who are capitalizing on the absence of strong anti-tobacco laws and interventions. There will be more focus by the global community on research and intervention in Africa. LGHI’s Director of Strategy and Communications, Abayomi Adeosun, made a poster presentation on Tobacco Cessation by Community Pharmacists; A Potential Opportunity Window, which was duly attended by a number of delegates. 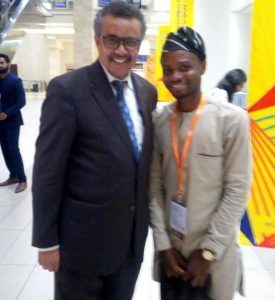 Noteworthy is the presence of representatives of the Federal Ministry of Health, Campaign for Tobacco Free Kids, and KNCV Tuberculosis Foundation.